The Moco Time Machine is a special version of the Time Machine made for motion control applications. 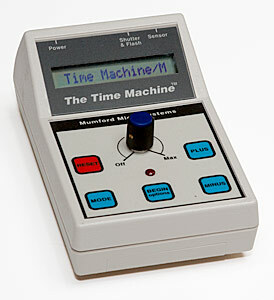 It contains most of the functions of the "standard" Time Machine, but adds expanded features for motion control projects. The Moco Time Machine ramped panning programs have been expanded to allow many more steps per frame, making it easier to do ramped dolly moves. The standard Time Machine is limited to 256 motor steps per frame. The Moco Time Machine supports up to 9,999 motor steps per exposure, with smooth ramping up and down. To avoid unnecessary delays when large step counts are required, the Moco Time Machine sends step signals to the new Mumford Motor Driver as binary-coded commands rather than a stream of step pulses. The Mumford Motor Driver then drives the stepper motor autonomously without holding up the Time Machine. The Moco Time Machine allows you to enter a time lapse duration of zero seconds (00:00:00). With no time lapse delay between exposures, the Time Machine will run pan programs quickly, allowing you to preview the motion in "real" time. This allows you to see where your ramped pan or dolly move will end up. Using the new Mumford Motor Driver, you can then flip the direction switch and run the same pan program again to rewind the camera back to the starting position. The Moco Time Machine has jacks for two stepper motor drivers. One jack receives signals from ramped pan programs, the other jack receives signals for fixed increment moves. Both channels can be programmed and used in the same time lapse, allowing one motor to drive a dolly (for example) and the other to drive a rotary pan. When not used for a second motor driver, one of the jacks can be used to output a "sync" pulse at each time lapse interval. In this context, the Time Machine can be viewed as a "Master", sending out a synchronizing time code. A second Moco Time Machine can become a "Slave" to the Master, getting it's timing intervals from the Master Time Machine instead of itself. In this way, both Master and Slave can run their own ramped pan programs on different axes, and both of them stay synchronized to the same time interval and to the camera shutter. Every Moco Time Machine can act as either Master or Slave. Any Slave can also be a Master to yet another Moco Time Machine as well. 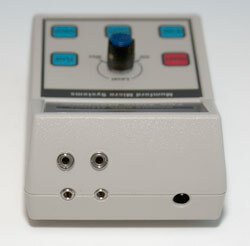 A pushbutton can be used to drive the Slave Mode, allowing manual stepping of a pan programs or motion intervals for stop action applications. A sync pulse from a Moco Time Machine can also be used to trigger a Sherline Motion Controller. If the Motion Controller is set to a fixed number of degrees, it will drive a second rotary table in constant (non-ramped) increments without a second Time Machine. Time Lapse - Execute a time lapse sequence with (or without) two axis motor control. Pan Programs - Enter parameters for up to 28 different ramped pan programs. Timed Shoot - Shoot a time lapse sequence by entering the specific times of day that images will be captured. This feaure is commonly used for time lapse construction projects and other types of event documentation. Shoot - Capture images in response to a wide variety of sensors. This mode is used to shoot birds and other wildlife, popping balloons, falling objects, and many other unattended shooting situations. Bulb Flash - A special version of the Shoot mode for capturing events that are too fast for the shutter. It holds the shutter open until a sensor is triggered, then pops the flash and closes the shutter. Movie - Trigger a LANC-equipped movie camera in response to sensors. Ballistic - Used with a special ballistic sensor to trigger a flash at the correct instant with bullets, pellet guns, etc. Measure Flash - Measure the relative duration of an electronic flash (with an appropriate sensor). Measure Lag - Measure the time it takes the shutter of your camera to open (with an appropriate sensor). Examples of these functions can be seen in the links at the top of this page.